Tattoos » Page 6 Now viewing page 6 of 7.
had some fun with this one... don't often to much color these day and started this one a while back. 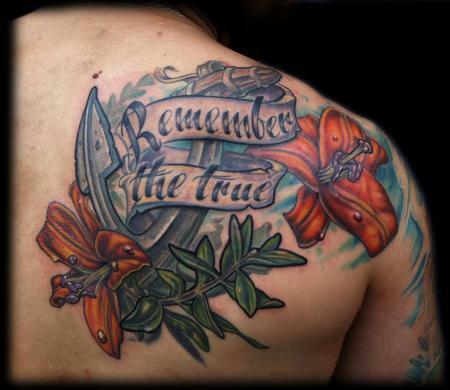 the client wanted a memorial tattoo for his grandfather. in this tattoo we were able to incorporate all the elements he wanted which were an anchor tattoo with two lily tattoos and an olive branch tattoo nautical tattoo. i did this black and grey crow / raven perched on a old dead tree shoulder tattoo on a great client for his first tattoo. it is a memorial tattoo for his grandfather. he was very open to letting me do my own thing with it and really could not be happier with this tattoo! especially because this was after the first pass! i have a few more tricks up my sleeve for the second sitting! 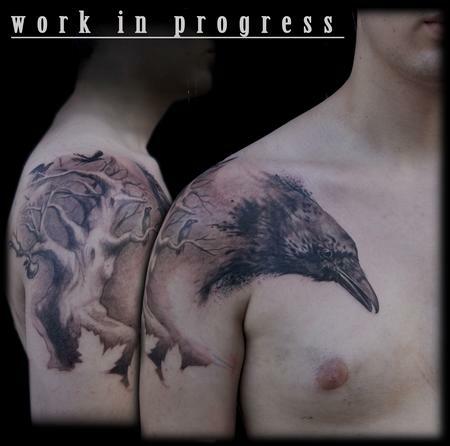 i freehanded the tree and perched crows and stenciled the crow portrait tattoo on his chest. did this tattoo at hell city the last day, on a great young woman who is also tattoo apprenticing in Indiana. this piece was alot of fun to do! 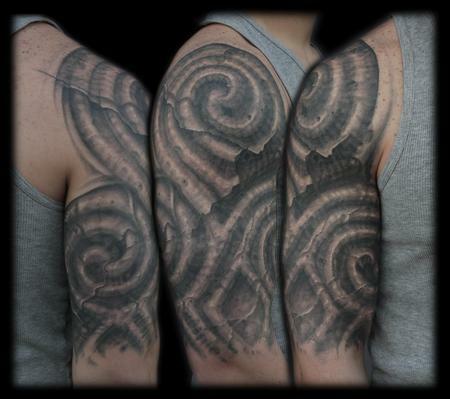 the client, jon, came in with the idea of taking the ancient carvings from newgrange and turning it into a half sleeve. all of this was drawn on and the progression and evolution of this piece was nothing like what we'd originally envisioned. needless to say we were both very please with the results! thanks for looking! 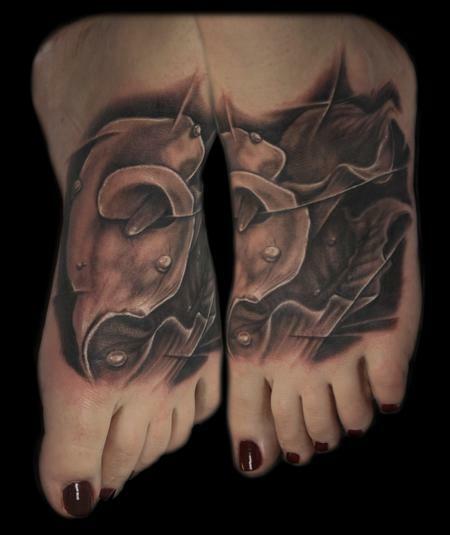 the client approached me with the idea of putting two calla lillies on her foot for her grandparents. i freehanded these on and incorporated with her want the diagrammatic/broken image lines that i've been doing alot of. had alot of fun with this one. first pass on this tattoo one more to go for it to be complete. 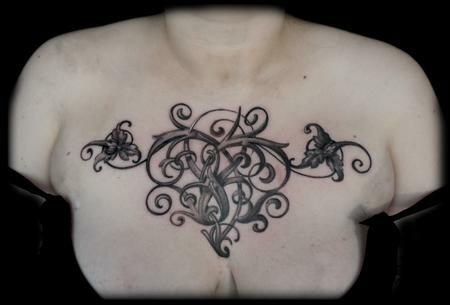 did this tattoo on a client who has been with me since the beginnings of my career. it's wild to see the progression of my work from the beginnings and very humbling. 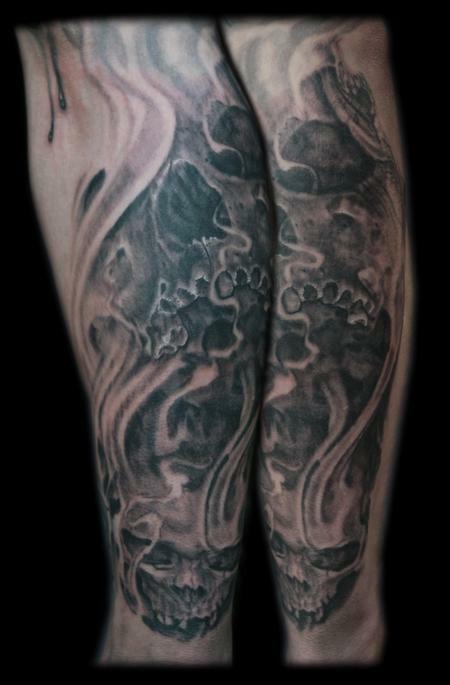 he wanted to incorporate skulls into the smoke that he had originally. i enjoyed playing with the out of focus elements of both the skulls and smoke in this piece. 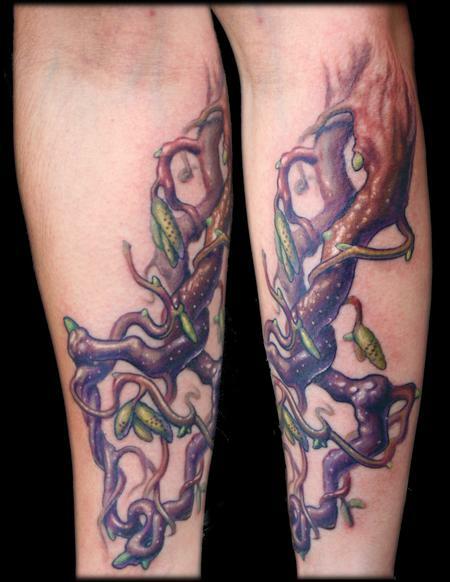 the client, sara ,came in with the idea of having a bramble arrow tattoo trailing down her forearm. it immediately brought me back to when i was little,staring and enthralled at this twisted walkingstick tree in our front yard, which became the direction for this one. more recently i've been doing alot of black and grey tattoos and it was really refreshing to do a subdued nature inspired color tattoo. 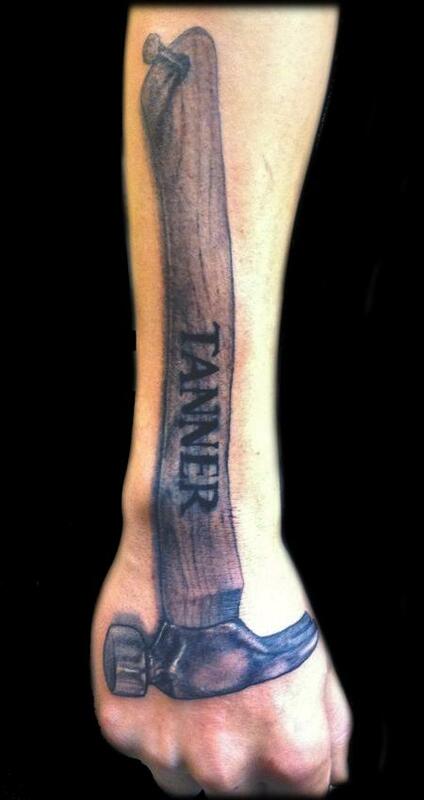 here's the second installment on matt's leg. again more breakthroughs. it's a work in progress so i shifted the entire picture to greyscale. 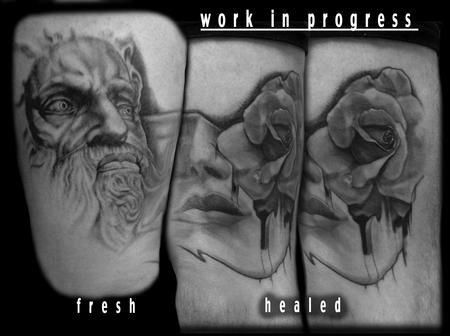 adding in more sculptures and sculptural elements into my tattoo work. can't wait for the next sitting! hope you like! this is the start of a massive project on matt the intern. 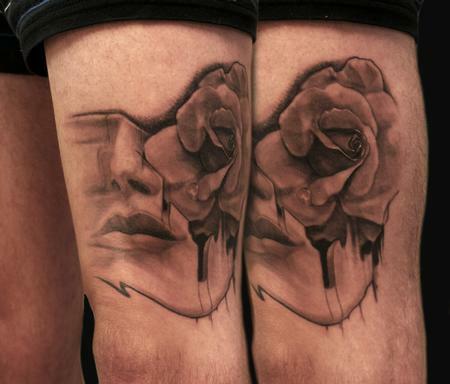 this tattoo of a woman's face breaking away to reveal a rose was a huge breakthrough for me! it came from one of my sketch-a-day where i was drawing to understand sculptures and creating a sculpted effect in tattooing and drawing, versus just rendering the subject matter. in spirit i had sensai looking over my shoulder. 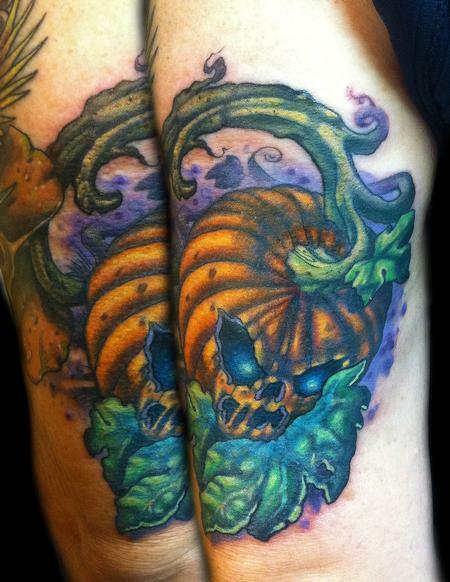 this was a pumpkin i did on a client after reworking an old school eagle of his. he actually started this in october too! i played around a little more with a cool purple atsmosphere to push some of the vines farther off into the distance. 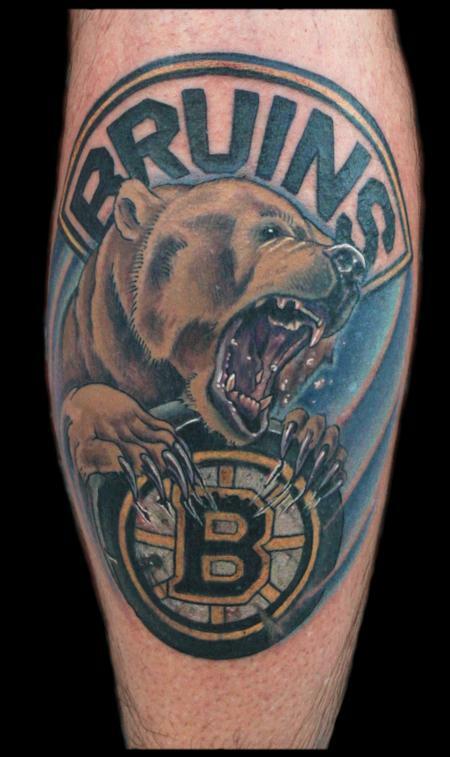 here's a bruins bear and old hockey puck with the bruins b tattoo. i did it an illustrated photorealistic style. i used a refenrence photo of a hocky ring for the cool blues and purples in the background to bring the temperature down a bit but to also compliment the warm colors of the puck emblem and the warmth in the bear fur.